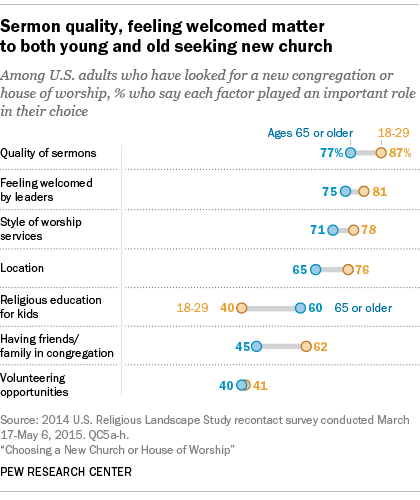 About half of all Americans have looked for a new congregation at some point in their lives. But how they have searched, and what they were seeking, has depended to some degree on their age. 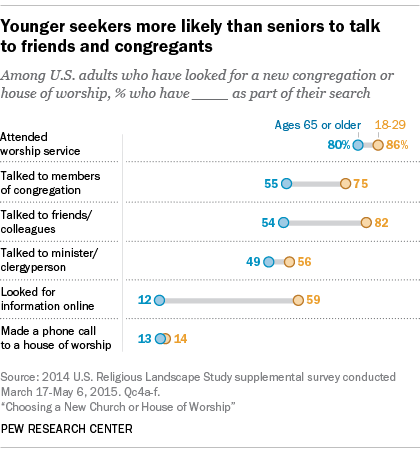 Younger adults were more likely than older Americans to turn to the web or to other people when looking for a new house of worship, a new Pew Research Center study has found. They also were less likely to prioritize religious education for children when choosing a church, possibly reflecting the fact that in recent years people have been waiting longer to have children. It might not be surprising that young adults are more likely to look online for information about a congregation, given that younger Americans in general are more likely to use the internet than older adults. Perhaps more striking are the age differences associated with seeking advice from others when choosing a church: At least three-quarters of adults under 30 talked to a congregation member (75%) or a friend (82%) as part of their search, compared with just over half (55% and 54% respectively) of people 65 or older. There were also some similarities among the age groups. For instance, across all ages, eight-in-ten or more adults say they attended a worship service as part of their search, and roughly half or slightly more talked to a clergyperson. Age-related similarities also were found in what people say were important factors in their choice of a new congregation. More than three-quarters of adults across all ages say the quality of sermons was important, although younger adults are slightly more likely to say this than older people (87% vs. 77%). Other commonly cited decision factors across age groups include the style of worship, a sense of feeling welcome and the physical location of the church. At the same time, younger adults are more likely than older age groups to say that having friends and family in a congregation was an important factor. About six-in-ten younger Americans say this (62%) compared with roughly half or less in older age groups.